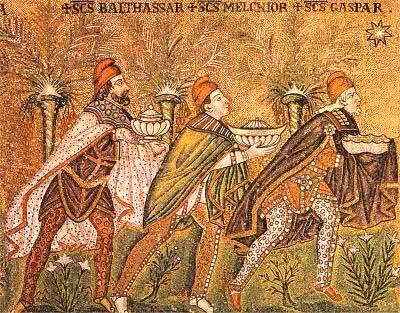 The collect and readings for the Feast of the Epiphany may be found here. The following sermon is based on Matthew 2:1-12. When our sons were young they often wanted a light left on when they went to bed. There was the nightly reminder, “Dad, don’t forget the nightlight.” Sometimes it was “Dad, would you leave the light on and crack the door.” They wanted a light that made sure the darkness would not overtake them. They wanted a light that would guide them through the night to the dawn of a new day. They wanted a light to remind then that everything was okay. I always turned on the light because I understood. I still do. I know what it is like to want a light to guide me through the darkness of life, a light that offers peace in the midst of anxiety, a light that will shine in the night times of life. I’ll bet you know about that too. Regardless of our age we are all looking for the light that shines in the darkness of our world, a light that will lead us beyond the borders of our life to a new country, a light that illumines the night skies of our life with hope, peace, and union with God. That is, I think what kept the wise men in tonight’s gospel watching the night sky. They were seeking the transcendent. They did not just happen to see the star in the sky one night. They “observed [the] star at its rising.” They were watching, searching. They saw it rise and in its rising their heard its call to follow. These astrologers teach us something about faithfulness. Often faithfulness in the night means simply watching and waiting, looking and searching, trusting and knowing that the darkness is not the final reality, light will shine in the darkness, and the darkness can never overcome the light. If the created light of human ingenuity, electric light, can comfort and guide two little boys through the night, imagine what the uncreated light of Christ does in our lives. The paradox is that the epiphanies of life, the manifestation of Christ’s light, happen in the night skies of our lives. Sometimes those night skies are the difficulties and sorrows of life. Other times they are the great mysteries that we cannot comprehend; the miracle of life revealed in the birth of our child or grandchild, the love of husband and wife, a peaceful and holy death. Sometimes the night sky is when we trust beyond what we can see with physical eyes or understand with logic, when we travel a path of unknowing, not sure of where we are going or how we will get there. The night sky is always about faith. Regardless of what your night sky is, it is the background, the context, the life in which Jesus’ presence, his life, his light, and his love illumine your way and change your life. It is the one light that makes all the difference in the world; not because the world is changed but because we are changed. Epiphanies are not an escape from home. They always take back to where we came from. But like the wise men we leave for our “own country by another road.” The old road can’t get us there. We can no longer speak, act, or think in the same old ways because we are not the same old person. We have seen the glory of God face to face. We have become epiphany.